On February 16, during the 3rd Ward town hall meeting at the KLEO Center just west of Washington Park, Pastor Torrey Barrett and Dr. Carol Adams announced their plan for a new organization representing Woodlawn, Washington Park, and South Shore. The organization will look to ensure that three communities affected by the upcoming construction of the Obama Presidential Library in Jackson Park have their concerns heard and interests met. It’s still in the phase of what Adams called “early community engagement,” and hopes to open the application for board seats within the next two or three weeks. “WoWaSo,” as it’s been informally named, wants to consolidate existing scattered neighborhood plans and push for a more comprehensive agenda regarding the Obama Library, but there are doubts and concerns about how fair this consolidation will turn out to be. 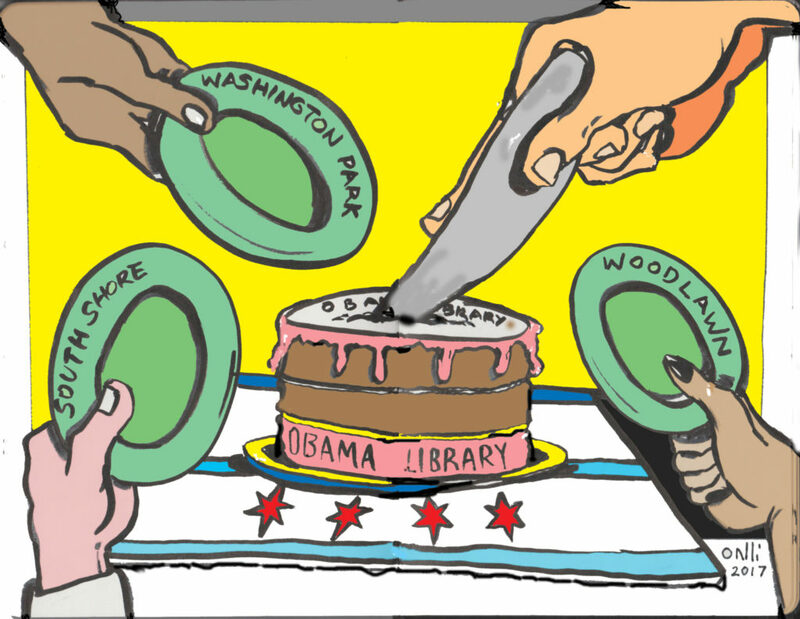 Ever since May 12, 2015, when the Obama Foundation announced that the University of Chicago had won the bid for the library, there have been tensions between some residents of Washington Park and Woodlawn because of the huge investment of capital and infrastructure the Library will bring to the neighborhood where it is built. In late July of this past year, Obama finally chose Jackson Park as the location. But even before that, Barrett, founder of Washington Park-based KLEO, didn’t think tension about the decision should turn into animosity. “It all started when the president started talking about whether it’s gonna be Jackson Park or Washington Park,” said Barrett. Once they chose the South Side of Chicago, reporters started to call. They were like, ‘Hey, what are you trying to do? It’s Jackson Park up against Washington Park.’ And I thought in a different way. No matter what community gets it, it’s gonna benefit the entire South Side. After Barrett’s phone call, the Network of Woodlawn and the Washington Park Consortium, which Barrett said KLEO “has done a lot of work with,” started working together. “We decided that, moving forward…the two organizations would champion the message that regardless of where it’d go, we want both communities to benefit,” Barrett said during the meeting. Sharing the benefits brought by the library, however, must take place on at least two fronts: first, making sure the library will in fact benefit the community instead of bringing another round of gentrification and dislocation. Second, making sure that every impacted community will get its fair share of benefits. To succeed on the first front involves attention from the city, the University, and the Obama Foundation on what the communities truly want. Currently, there’s a sense that there has been an insufficient amount of engagement from these parties, a sentiment expressed by 5th Ward Alderman Leslie Hairston among others. In an open letter to the Foundation, Hairston called for more attention to the community’s needs. Hairston is not the only one who feels uneasy about the current level of community engagement—so do Barrett and Brazier. “We got word that the city is about to put together this task force, and the task force is going to oversee the process,” Barrett told the audience at the town hall meeting. “I said, ‘I don’t think this is a good idea because it will have no credibility within the community.’ So Dr. Brazier and myself went to the mayor. We had a conversation with him and we said, if the city launches this task force and you are not gonna engage with the community to do this process, we think it’s gonna be a total failure.” Barrett did not say what Mayor Emanuel’s response was. But how strong should the voice of the communities be in order to make the Foundation and the City listen and open negotiations more widely? Even if they open up negotiations, what specific plans should the communities, whether in Jackson Park or in Washington Park, bring to the table? And how can communities make sure that the plans they raise in fact represent the true interests of the residents? Those questions make up the second challenge of sharing benefits across the three impacted communities, a challenge that will take place within the three neighborhoods. This challenge motivated Barrett and Brazier to create a cross-neighborhood organization that will unite the impacted communities and collectively bargain for community interests. Their pursuit found support from the Chicago Community Trust (CCT), a grantmaking foundation that aims to give local residents opportunities to support their communities; CCT also selected Next Street, an advisory firm, to be part of the preliminary research effort for Barrett and Brazier’s organization. According to a Tribune article about a community meeting Brazier held on February 21, where the concept of the cross-neighborhood organization was introduced to Woodlawn residents, CCT granted Next Street $250,000 for funding and donated another $75,000 to Brazier’s own foundation. The formation of Barrett’s and Brazier’s concept took eighteen months and started before the final location was determined. Now, Barrett said, comes the work of setting up this organization. After Barrett spoke, Dr. Carol Adams, the former president and CEO of the DuSable Museum of African American History, took the floor and started elaborating on the concept of a Woodlawn–Washington Park–South Shore coalition, which she affectionately dubbed “WoWaSo,” although the official name of the coalition has not yet been announced. Adams argued that existing plans for the library are scattered around the impacted communities, generated by many different organizations, and are redundant in their pursuits. “We know we have strong communities,” said Adams. “In other words, [the Foundation is] not coming to a place where nothing is. Our communities have assets; they have strength. They have great human capital, great opportunity, institutions, histories, and legacies,” Adams said. “We heard there was a desire to collaborate across existing organizations, rather than to silo this. However, the story of genuine cooperation across communities did not strike everyone in the audience as convincing. Donna Hampton-Smith was the first person present to express her concerns. “I’m just gonna be really honest that I don’t appreciate the process of this…You have the ear of a lot of people so I want you to take this back to those people you talked to. First of all, if there was funding that came for Next Street, there should’ve been a RFP process to allow people to apply for that,” she said. A request-for-proposal process, abbreviated as RFP, is a process that allows different parties to bid and compete for funding. Next Street didn’t go through this process to receive the grant from CCT. “Secondly, the process of selecting the advisory committee for Obama Presidential Library, they selected you and other people,” said Hampton-Smith, directing her comments at Adams. “I didn’t hear anything about this being put out in the community for application.” Adams was selected to the University of Chicago’s Community Advisory Board for the Obama Presidential Library in January 2014, before the University won the bid. According to a UofC news release, the board is composed of “prominent South Side community leaders who, over the course of their careers, have demonstrated an enduring commitment to strengthening the quality of life on the South Side of Chicago and in the city more broadly.” The UofC did not release any more specific information on the selection process for the Advisory Board. But Hampton-Smith’s worry was also broader than just Barrett and Adams; she wanted to know how it would be determined who exactly had a say in the WoWaSo coalition. A link to the community feedback survey was given out during the meeting; the survey is designed to collect opinions and concerns from residents of different neighborhoods. Instead of interviewing the same self-appointed, decades-old community spokespersons and organizations, why not walk within these same neighborhoods, talk to the residents within them, and get a more accurate analysis of what they really want to see? The things you hear from them might surprise you. If anyone really thinks that the “city” and “others” that control the urban development in Chicago is going to turn the control over to the residents and the community, they are misinformed on how the process REALLY works! The plans for urban development takes place long before the average citizen gets any notice of the changes. It’s part of the 30, 40, 50, year plan and the “usual suspects” will always be the “go-to” people to represent the “voice” of the people to keep them “in-line” with the REAL objectives. It’s a sad truth, but if your start looking at who’s leading the charge, invited to the table or otherwise providing “community input” the road will ALWAYS lead back to the same individuals, organizations and institutions! We need to exercise our discontent during election time! The more things change, the more they stay the same! Change in Chicago is NOT inevitable, it’s a process the residents need to put into action and KEEP working toward! We just learned about this in South Shore last night, in a poorly-advertised meeting at the South Shore Cultural Center. A good number of us are surprised at our inclusion in this initiative and quite skeptical about it.